Today was our last full work day with the Habitat crew. While this is sad as it means our trip is coming to an end, the team is excited to have lunch with the Habitat workers and future homeowners tomorrow at Habitat’s warehouse. Today started off relatively the same as the rest of the week. After breakfast Katie Lazo gave the morning devotional, and the crews all headed to their sites. We sent out four teams today, one each for siding, drywall, and basement insulation. There is not much new to say for the work accomplished. Many of the skills we began developing at the beginning of the week we are now putting into better use on the sites. There is now much less instruction from the Habitat workers, with the SUMC teams being able to be turned loose on the job site. The painting crew returned to their previous site to continue the work accomplished on Wednesday. They pulled up carpet, and painted the basement steps as well as the front porch. They also pulled up weeds around the house. All in all, in two days the house went from line green, yellow, and orange to a white. The rehabilitated home is on its way to being ready for a new homeowner. 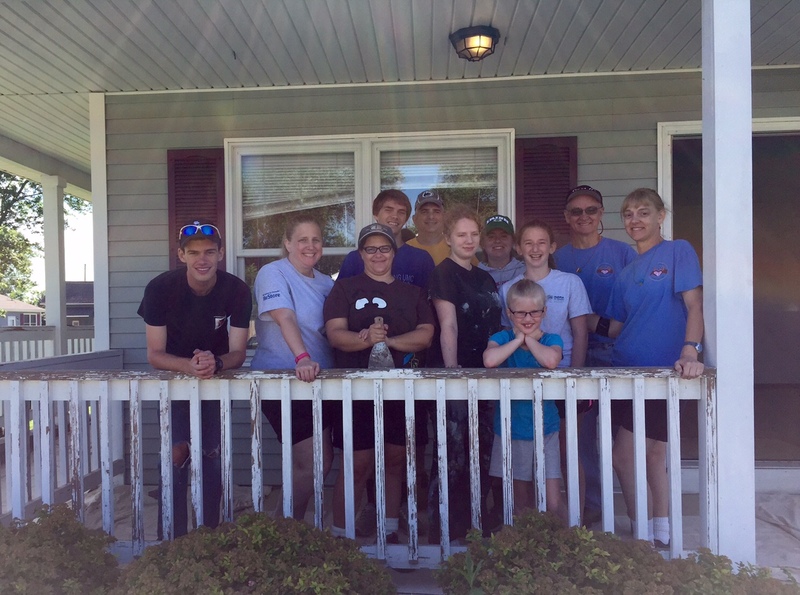 A team returned to the Owens’ house to complete the siding. There they met Ruddy, a member of the Habitat crew. He spends most of his time working in the warehouse, and only gets to work on a site once every month. Carol, a recent retiree from Canton, joined the team in hanging siding. Habitat’s family coordinator commented how amazing it is that people from so far and people from so near joined together to house one family that they didn’t even know. A big conversation topic was what motivated the youth at SUMC to go and serve strangers hours away in another community. Why we do what we do was the big lunch conversation. 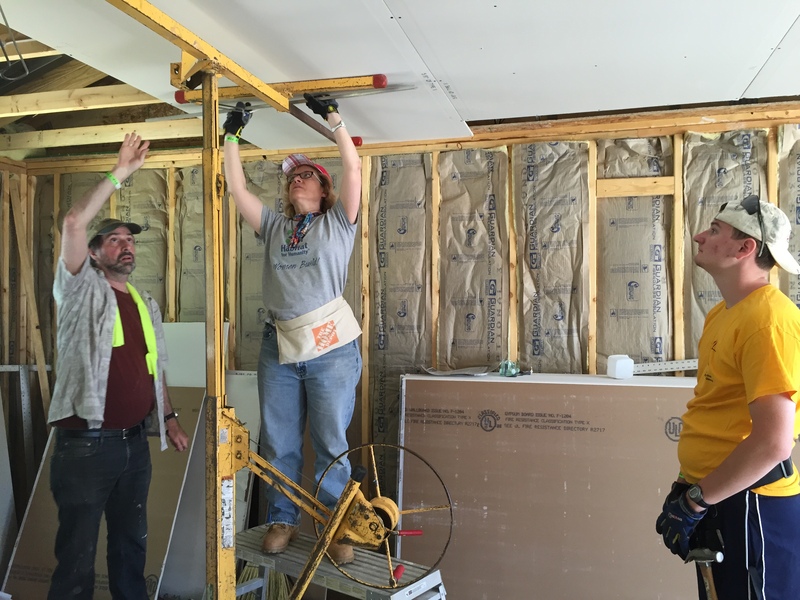 Two of our other teams went to different worksites of Habitat’s current eleven ongoing builds (nine fully built homes and two current rehabilitation sites). The Habitat program here is big, and their work is constantly growing and expanding. They plan on starting three building projects during the next three weeks. These ongoing homes are at all different stages of the home building process. 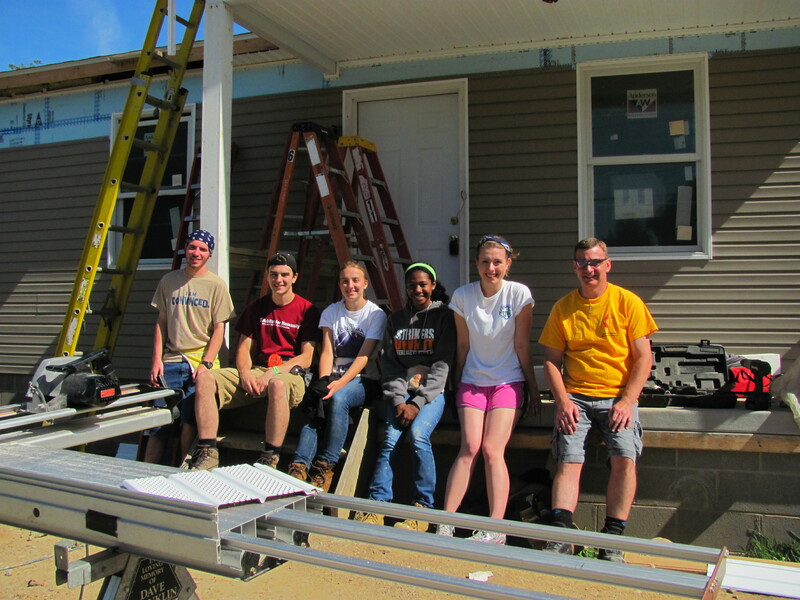 Today our two teams worked on drywall, basement insulation installation, and some outdoor siding. After a successful day of work, significant progress was made to the final product of a well built, efficient home. Lunch was especially good today due to the recent addition of baloney (also known as Bologna). After the work day was done some of the youth hit the pool before the big football game celebrating Jacob Printz’s birthday. There was even a referee with booth review, as well as fans, spectators, and cheerleaders (mostly just Juliana and Kendra Barham). After two twenty minute halves, Jacob’s team won nine touchdowns to eight, beating the other team with a long last second Hail Mary pass. Games of munchkin were played before dinner where the team had Mike Dinsmore’s experimental cheeseburger pie. 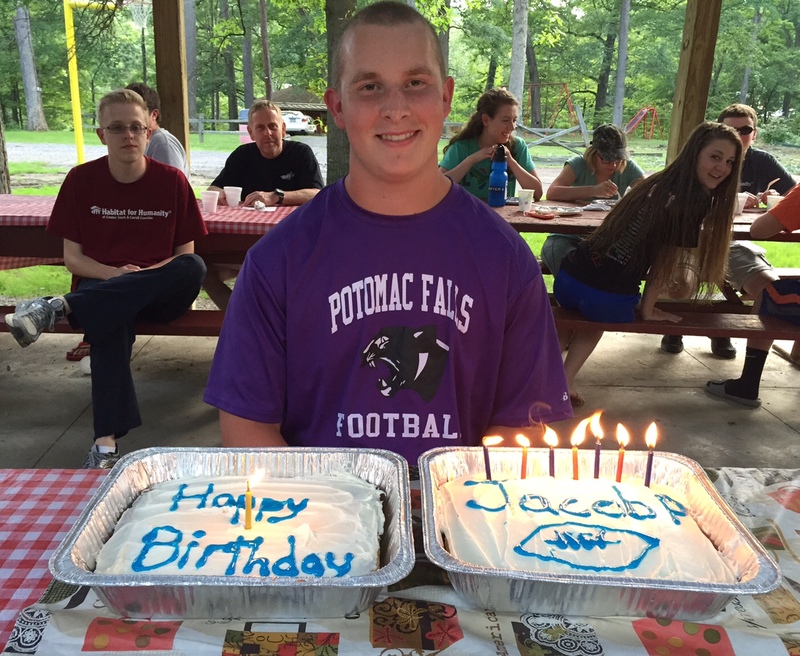 The experiment was a success, and the team also celebrated Jacob’s birthday with birthday cake. The team then wrote thank yous to our prayer partners, as well as other folks who made the trip possible. We had worship where Annica Pollock gave a devotional about trusting God’s plan in your life. Now the team will get some much needed rest before our big last day with Habitat.